On behalf of the Board of Directors, Staff and Members of the Social Development Centre of Waterloo Region (SDCWR), it is with great sadness and heavy hearts that we announce the passing of our beloved Executive Director, Trudy Beaulne on Friday, January 5th, 2018. Trudy joined the SDCWR in June of 1999, and for over eighteen years acted as the agency’s longest-serving Executive Director. 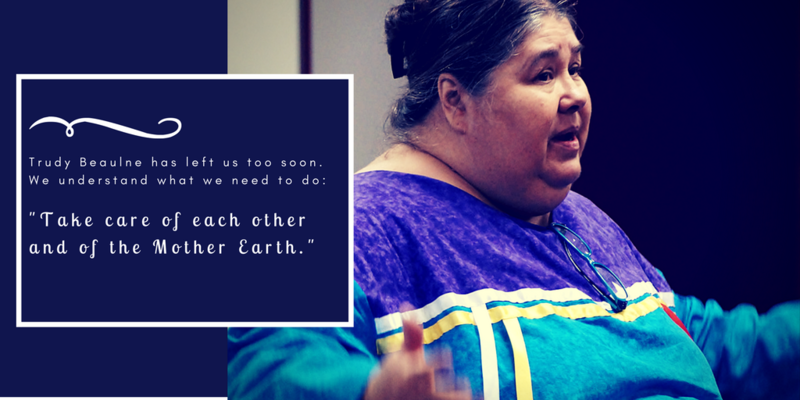 Throughout this time, Trudy shared with us her vast fountain of knowledge, her incredible leadership abilities, and her hope and love for humanity as the true caregiver for Mother Earth. Trudy was a community advocate, who fought tirelessly throughout her life to represent society’s marginalized populations. Her leadership style was based on the empowerment of others, and she held strong a person-centred perspective towards social justice and equality. Beyond the SDCWR, Trudy was also engaged with countless community projects. She served for two decades on the Boards of the Social Planning Network of Ontario and InformOntario – The Association of Community Information Centres in Ontario. Trudy was equally rooted in her own residing community, serving on the Board of the Mount Hope-Breithaupt Park Neighbourhood Association, while providing leadership to Kitchener’s Festival of Neighbourhoods for the last 24 years. Trudy was most vocal in regards to poverty elimination, respect for human rights and dignity, and improving the lives of persons with disabilities. Trudy contributed to the success of numerous initiatives in the Region, including Livable and Inclusive Communities, Living Wage Waterloo Region, Poverty-Free Waterloo Region, Affordable Housing and VisitAble Housing. Determined to broaden the decision-making process to include voices from a whole spectrum of lived experiences, Trudy advocated and provided space for accessible and inclusive public consultation and deliberation wherever possible. Anyone who had the pleasure of meeting Trudy could testify to the fact that her passion was contagious. For Trudy, her work was not simply a vocation to her—it was a way of life. Trudy’s very soul lived and breathed compassion. To be around her was to feel inspired. In recent years, changes in our societal landscape and challenges with retaining consistent levels of funding, made work at the Centre extremely unpredictable. Nevertheless, Trudy remained steadfast in her unwavering commitment to making the Centre an agency that could provide leadership and resources for community development in Waterloo Region. It is the legacy of her work that we are committed to carrying forth in the years to come and we hope you will join us. One of Trudy’s favourite quotes was Mahātmā Gandhi’s “Be the change you wish to see in the world.” Trudy – you have forever changed our worlds. We miss you more than words can possibly ever say. Trudy Beaulne, our spirited and beloved Executive Director, passed away on Friday, January 5, 2108. Visitation and sharing of memories are taking place on Friday, January 12th at Henry Walser Funeral Home 507 Frederick St, Kitchener. Visitation starts at 10am and Memories will be shared at 2pm.